FREE Frizz-Free Blowout at Ulta! FREE blowout using Living Proof products when you book an appointment. Choose your style, straight or wavy & keep it Frizz-Free all weekend long. Reserve your appointment today! Appointments limited. 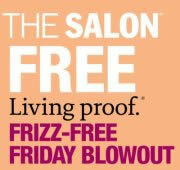 PLUS spend $25 on Living Proof products and receive a FREE Frizz Restyling Spray 3.4 oz. (a $24 value).